The right network toolset designed to easily manage and troubleshoot your network. Discover your entire network, including equipment, MAC to IP address relationships, Switch Port mapping, and more. Monitor and receive alerts in real time on network availability and health. Simulate attacks on your network to identify security vulnerabilities. Configure devices on your network and troubleshoot any config issues with specialized network engineer tools. Deploy an array of network discovery tools, including Port Scanner, Switch Port Mapper, SNMP sweep, IP Network Browser, MAC Address Discovery, Ping Sweep, and more. Monitor your network and receive alerts in real-time with Response Time Monitor, Memory Monitor, CPU Monitor, Interface Monitor, and TraceRoute. Perform robust network diagnostics for troubleshooting, and quickly resolve complex issues with a network toolset that includes such as Ping Sweep, DNS Analyzer, and TraceRoute. Recover lost passwords, simulate attacks to identify vulnerabilities. Ensure network security with handy tools including Router Password Decryption, SNMP Brute Force Attack, and SNMP Dictionary Attack. Manage device configurations as well as SNMP traps for enhanced log management. Administer devices with Config Compare, Downloader, Uploader, and Editor. Effectively create, receive and log SNMP traps with SNMP trap editor and SNMP trap receiver. Monitor IP addresses and DHCP servers, perform subnet calculations, identify DNS database errors, and more. Make IP address and DNS management easy with network engineer software such as Subnet Calculator, DHCP Scope Monitor, DNS Structure Analyzer, DNS Audit, IP Address Management, and others. 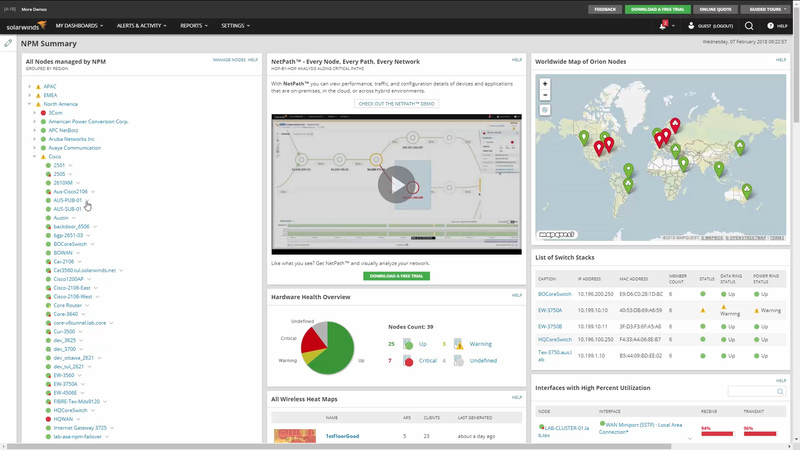 Monitoring tools start contextually from monitored elements within SolarWinds® NPM solution enabling faster problem-solving. Launch popular tools from a web browser. Quick access to all desktop tools from a unified console. Install and begin using Engineer's Toolset’s desktop console in minutes. Features Overview The right network toolset designed to easily manage and troubleshoot your network. Engineer's Toolset is an industry favorite. Hands down. Where can I find information on installation and customization for my ETS product? Our New to ETS section was created using customer feedback and contains videos, guides, and articles that will help you be more successful with your installation and customization. Engineer’s Toolset is a collection of over 60 powerful tools that let you discover, configure, monitor, and troubleshoot your network.